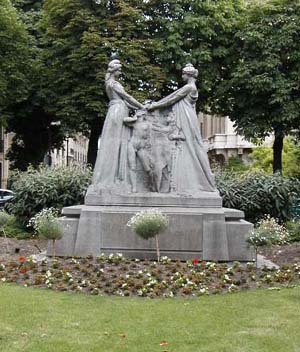 A statue of France and Belgium, holding hands, near the Place de l’Alma. Maybe they were plotting the rejection of the EU constitution way back then. The beautiful city hall of Paris. View of a small slice of the monstrous Pompidou Center from the narrow rue Simon le Franc, in the ancient garment district of Paris. It is true that for good croques, one must use really good gruyere for the cheese; not cheap emmental or such. Tom said that he recently read that the Parisian street cleaners once had to go on strike in order to get better brooms. So, the French government can indeed get in the way of quality, but the French people want high quality. I like French people. I studied a bunch of recipes for croque madames (AFTER I’d already been making them) on the internet. Here is the most accurate one that I found (i.e., it is closest to what is actually served here in the brasseries). Unfortunately, it is in French. Let me know if you want a translation. I usually use 7-grain bread for mine. Tom likes his on white bread. Well, today the folks in New York finally gave marching orders for the next chapter of the textbook Tom is working on (and I’m helping with), so we went to the English bookstores today. We had to go to three of them to get everything on the list (all non-fiction best sellers). First we walked all the way from the apartment to Brentano’s, near the old Opéra. We stopped at the Swatch store at Place Vendome (where the Ritz is now getting a face-lift) to buy a Swiss watch for me, to replace my old Gruen which is just plain worn out. Brentano’s had several of the books on the list. Next we went down to rue de Rivoli, in an attempt to find W.H. Smith’s bookstore, but we found Gagliani first. Gagliani’s claims to be the first English language bookstore on the Continent. They had one of the books on the list, Blink. Then we re-fueled at 4PM Angelina’s tea room on rue de Rivoli. This is a place that you really must experience. And you must have hot chocolate there. I think it is called Chocolat a l’Africaine – very, very thick dark warm chocolate served with whipped cream on the side. Before that Tom had a club sandwich and I had a salad called Assiette de Angelina, which included a nice slice of foie gras and lots of vegetables including haricots vert and artichaut and a fine vinaigrette. Yumm. Finally, we found WH Smith, who did indeed have the last book on the list, Everything Bad is Good for You. I’m not going to say what the other books are because I don’t want the competition to know. Sorry Andrea! All of that entailed about three hours of walking, so we took the métro home from the massive station at Concorde. We concluded this acquisitive day with a stop at the fromagerie on rue du Commerce to buy more gruyere for croque madames. Yesterday’s walk started with a métro ride to the vicinity of Place des Vosges. We wandered around there and over to rue de Sevigne, where the Musée Carnavalet is located. If you are interested in history, put that museum on your list of places to see. I encountered a recently installed (March 2005) sign on the side of a school across from this museum. 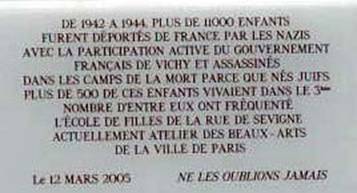 Its wording indicates that the French government is admitting, more and more, its complicity with the Nazi’s during the occupation, and its guilt for the deaths of so many Jewish residents of Paris. This neighborhood was one of the Jewish areas of Paris in the first half of the 20th Century. Many had come to live there to escape terrible pogroms in eastern Europe in the early 1900s. We walked through the garment district to the improbable Centre Pompidou, and then took a break at a café on rue Saint Martin, where I had a funny and confusing time ordering a glass of red wine from the waiter, because I assumed he was French but he really was British and he was trying to get me to speak English. When I figured that out, I did. 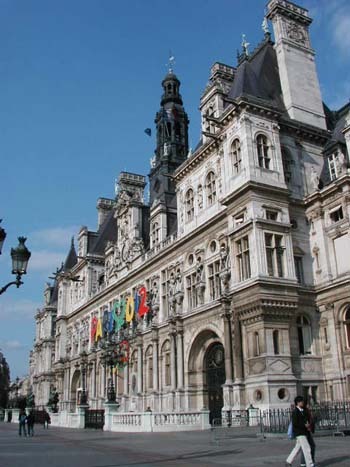 From there, we went to the Hotel de Ville (Paris city hall), where we saw that there was a photo exhibition called “From Refuge to Trap,” about the plight of the Jews who had settled in Paris only to find themselves sent off to death camps in the early 1940s. We spent quite a bit of time absorbing the exhibition, reading all the information in French, and breaking our hearts. 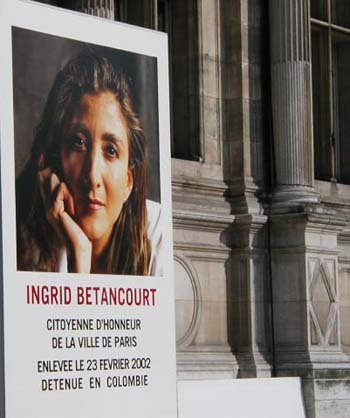 Upon exiting, I noticed a banner on the front of the city hall with Ingrid Betancourt’s photo on it. We will never forget about you, Ingrid. She is still being held hostage in Colombia. I wrote about her in 2002 and 2003 in the Paris Journals. We even participated in a march to support her in Paris. I think that was in 2003. Ingrid spent much of her childhood in Paris, where her father was a Colombian diplomat. She also went to the Sorbonne’s political science college here. She has many French ties. I have to go hit the books. Au revoir.